YAVORIV, Ukraine -- Joint Multinational Training Group-Ukraine, also known as JMTG-U, is in its second rotation training Ukrainian Ministry of Defense (MOD) forces at the International Peacekeeping and Security Center (IPSC) in western Ukraine. 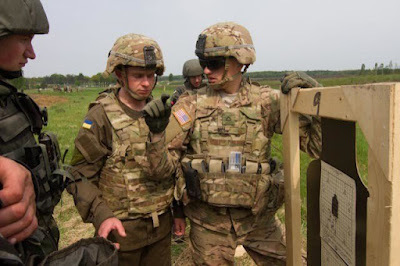 A paratrooper with the U.S. Army's 1st Squadron, 91st Cavalry Regiment, 173rd Airborne Brigade, gives marksmanship advice to a soldier with the Ukrainian National Guard's 3029th Regiment, May 6, 2015, during Fearless Guardian in Yavoriv, Ukraine. The JMTG-U mission is part of ongoing efforts to contribute to Ukraine's long-term military reform and professionalism and to help improve the country's internal defense capabilities and training capacity. JMTG-U is uniquely built with key players that include the National Guard and active duty Soldiers, U.S. Army civilians, and representatives from Canada, Estonia, Lithuania, and United Kingdom. The California National Guard maintains headquarters responsibility, continuing to develop a valued relationship with Ukraine through their 23-year-old State Partnership Program. The 3rd Battalion, 15th Infantry Regiment, 2nd Infantry Brigade Combat Team, 3rd Infantry Division, from Fort Stewart, Georgia is responsible for training the MOD forces for the next six months. "It gives them the opportunity to work with Ukraine and their Armed Forces and ensure that they receive what they need to become a more capable military," said JMTG-U Deputy, Adam Loveless. The mission will not only test the expeditionary skills of the "CAN DO" battalion, but continue strengthening the relationship between the two armies. The Joint Multinational Training Command (JMTC) plays a crucial role in the mission as they help develop a Combat Training Center much like Grafenwoehr Training Area, U.S. Army Europe's elite training ground. "This is a partnership with the Ukrainian Army to build a capability here that enables them to train their formations to a better standard than what they do right now, utilizing what we have learned to run combat training centers," said Loveless. The line of effort will include JMTC capabilities from the Joint Multinational Simulation Center, Joint Multinational Readiness Center, and Training Support Activity Europe. "Right now, we're doing the initial portions of that in conjunction with Joint Multinational Training Group-Ukraine in developing the training cadre. As they build that force, we are working with the 3-15th to build a training cadre to serve as the Observer Coach/Trainers like at the Joint Multinational Readiness Center. JMTC is going to continue a partnership with the Ukrainian Armed forces to further develop them to a level to become NATO interoperable by 2020." Plans for capabilities, such as an opposing force modeled after JMRC's 1-4 Infantry, building infrastructure much like Grafenwoehr's Training Area, and a range complex to support live fire ranges and maneuver training are also underway for IPSC. Loveless says these efforts are not only a necessity for the Ukrainian Army, but are strategically important to Europe. "Ukraine is a country that absolutely wants to fight for its own sovereignty here. They've asked for our help, they've asked for the help of the Allies in NATO and we owe it to them to give them an opportunity to succeed."